Books | Praise for "Special Karma"
A novelized version of Merry White's experiences at Dai Bosatsu Zendo including Eido Shimano's predatory behavior. Maine, USA -- "Special Karma" is a fascinating novel, of interest to anyone who has attempted to do meditation practice or follow a spiritual discipline, to anyone who has fallen in and out of young love. In it one experiences the intensity of life deeply apprehended, the attractiveness of a character who is both honest about and just slightly amused by the events of her life. Central to the story is the theme of a spiritual teacher (the Japanese Zen Roshi) who abuses his position by initiating sexual liaisons with his female students - and whose approaches to the protagonist, Iris, ultimately lead to her disillusionment about practicing Zen and living in a Zen center. 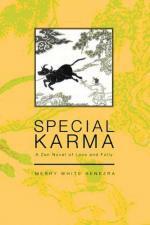 Special Karma is the only novel I know of that presents the theme of the sexual misconduct of a Zen master. Benezra handles this delicate subject with an understatement and irony consistent with the thoughtful, personal tone of the whole book.